The Networks Division of Samsung Electronics America, Inc. and Verizon have announced plans to test LTE Femto cells in unlicensed spectrum (LTE-U). Samsung Electronics, one of the world's leading providers of mobile communications solutions, and Verizon, a leader in 4G LTE and the founder of the LTE-U Forum that drives the technology in the U.S., will be engaging in a trial focused on Samsung’s LTE-U enterprise Femto cell that will conclude at the end of 2015. The companies expect the LTE-U-enabled small cells to be commercially available in 2016. "Samsung is proud of the work we have accomplished with Verizon in the LTE-U Forum and we are excited to deliver the network solution and devices to continue to power their networks," said Mark Louison, Networks Division Senior Vice President and U.S. General Manager for Samsung Electronics America. “This solution illustrates our continued focus on delivering the highest quality LTE experience to our closest partners while using unlicensed spectrum." "We are eager to trial Samsung’s new solution, and expect that it and other solutions from the LTE-U Forum will continue to drive our leadership position in offering the best wireless network and solutions to our customers," said Adam Koeppe, vice president of network planning for Verizon. The Samsung LTE-U solution is designed to leverage unlicensed spectrum and aggregate it with carrier licensed spectrum to further enhance LTE network coverage and performance. The new Samsung enterprise Femto cell features technology to ensure co-existence between LTE-U and other services, like Wi-Fi, on unlicensed spectrum. Additionally, Samsung’s solution supports 2x2 Multi-input Multi-output (MIMO) on both licensed and unlicensed spectrum bands. With more than 35 years of experience in developing and commercializing telecom network technologies, Samsung’s Networks Division has partnered with mobile service providers around the world, helping them to successfully implement advanced LTE solutions. Samsung’s network solutions have been globally recognized and have been successfully deployed in the U.S., Korea and Japan, allowing carriers to seamlessly integrate multiple communications protocols to create a unified experience for customers. In addition to LTE-U, Samsung will also feature their comprehensive in-building solutions, professional services and emerging public safety and 5G network solutions during CTIA’s Super Mobility Week in Booth #3122. 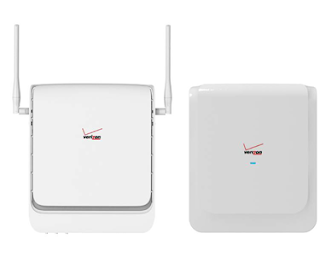 Verizon Wireless solutions are also on display in Booth #2622. 0 comments on "Samsung and Verizon expect the LTE-U-enabled small cells to be commercially available in 2016"